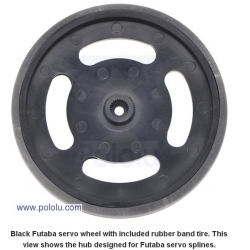 The 2-5/8" plastic Black Wheel Futaba Servo Hub is made specifically for Futaba servo splines and has a diameter of 2-5/8". Each wheel comes with a pair of black rubber bands: the tyre and a spare. This plastic Futaba servo wheel is made to match Futaba servo splines, such as those on the SpringRC SM-S4303R continuous rotation servo. 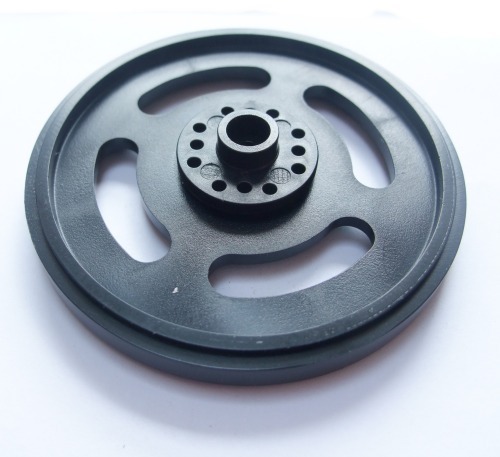 The wheel is molded from ABS and measures just under 2-5/8" across by 0.3" wide. With the included rubber band tire, the total wheel diameter is 2-5/8"